Folic Acid (Vitamin B9) is recommended by Health Experts during pregnancy, Folic Acid cannot be made by the body and therefore must be supplied through the diet to ensure daily requirements are met. Folic Acid is naturally found in leafy green vegetables, citrus fruits and meat. 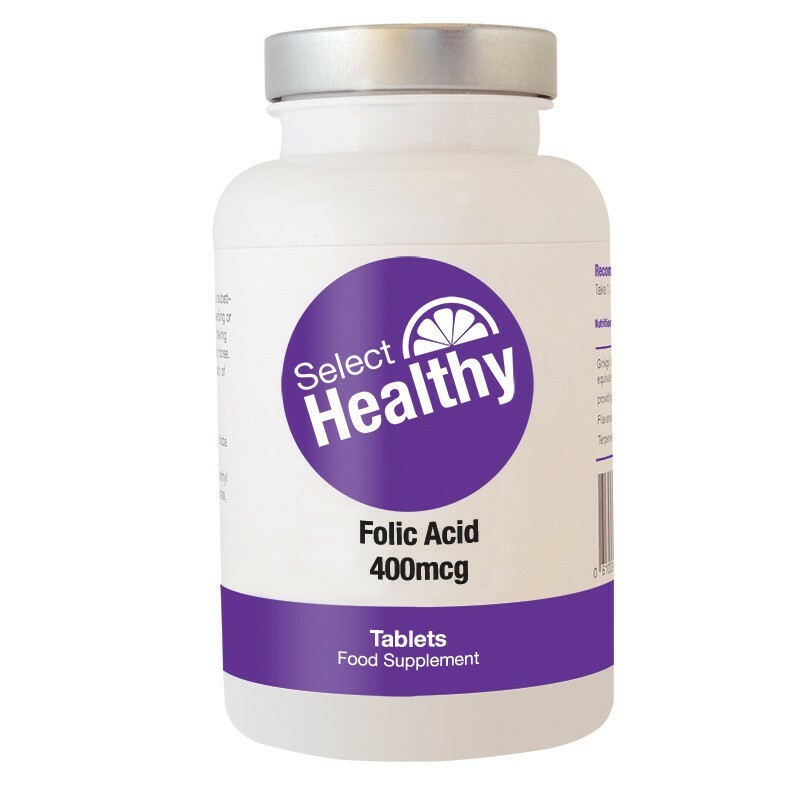 Our Folic Acid contains 400μg per tablet. Microcrystalline cellulose, Dicalcium Phosphate, Starch, Sodium Starch Gluconate, Polyvinyl Pyrrolidone, Magnesium Stearate, Silicon Dioxide, Folic Acid. I took this for my pregnancy and still take it even though my little one is 18 months now as it is great for heart health-select always deliver safely and quickly(sometimes in just a few days). I used this all through my first and second pregnancy, and now continue to take it for my heart health. Good for my heart and a great price, who could want more than that. One of many supplements i order from Select, my orders usually arrive in good time. An easy to swallow tablet that provides the correct dose needed for a healthy pregnancy. S H are highly recommended . Good for heart health, prompt delivery. I was recently diagnosed with a poorly pancreas,which means that i am not absorbing foods properly.A long with a few medications they also recommended a supplement of folic acid, i thought this was only for pregnancy but apparently it does more for you than you realise.I have now added this to my usual supplements supplied by select. I have anaemia and my doctor recommended supplementing my diet with folic acid.Select offer great value and low cost supplements, and i receive my orders without problem. I took Folic Acid all through my pregnancy as advised by my by doctor,i now have a healthy baby boy who weighed in at a good 8 pounds.I now continue to take folic acid for my heart,thank you for prompt delivery. My partner and i are trying for a baby , i began taking this in anticipation.A very nice price and it arrived safely. a recommended supplement for a healthy baby and also supports a healthy heart.select healthy have never disappointed me ,recommend. with all the recent coverage of female heart disease ,i decided to take this as a preventative ,cheap and has good reviews on the web. dont get pregnant without it ,it is vital to a healthy pregnancy ,select healthy provided good service and good price. this is a must have for anyone trying to get pregnant and anyone who is pregnant,i take every day . i took this all through my pregnancy ,i carried on taking it as i found out that it is also good for your heart and i want another baby so being prepared.